The international dutch chain of fashion retail, C&A has integrated Facebook’s real-time data and has brought it into the physical world. 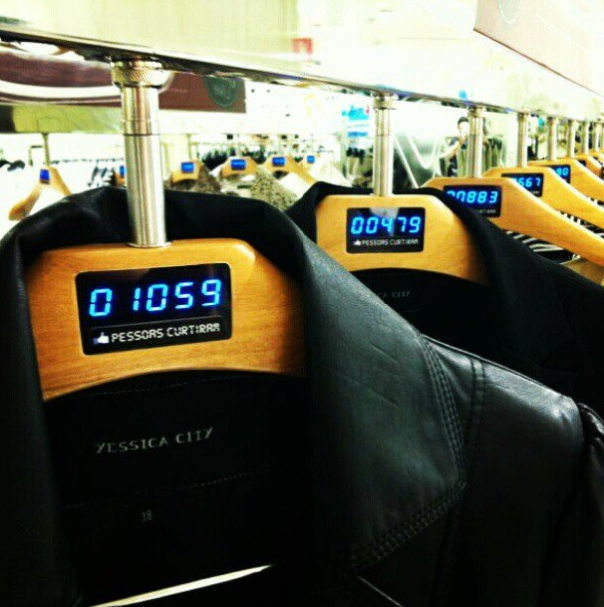 Essentially, C&A’s stores in Brazil have been putting “real-time like” counters on its hangers. The data is taken from C&A’s Facebook page where the company lists the clothing items for fans to interact with. The idea is built on the concept that you no longer need a friend to shop with to ask them “if this is good”. The problem with this though – in that an image online says nothing about the quality, the fit, or the fabric. (Which is why we see companies like Saks trying to address that problem by creating “Fashion in Action: Video Catalogs”.) So, if your in the retail store C&A, and spot an item that’s hanger has has only two likes from Facebook and but looks great in person- you’re bound to buy that item anyway. In which case, I guess you could use these real-time hangers to gauge your tastes: on how mainstream to how unique your fashion tastes are? Anyways, I just thought this was pretty cool in taking real-time social media and bringing it to the next level. Viral Marketing is one of the most effective forms of advertising available. By now we’ve been exposed to Dove’s “For Real Beauty” campaign. It’s been around for quite some time, my estimates are around since 2004. But don’t quote me on that. I recently just saw it floating around somewhere on facebook. And while I’ve seen it quite a few times – It hasn’t gotten old – and I continue to be a fan of the campaign. For those of you who might need a refresher, the campaign was an effort to have “real women” models (ie not super skinny models) to promote Dove products while boosting women’s self confidence. A marketing strategy based on the idea, “to make more women feel beautiful every day by widening stereotypical views of beauty.” Sound familiar yet? It should. Do you think it made women feel more beautiful? I do. And do you think Dove sold more soap bars? Probably. Now as of latest, Dove has come out with “The Ad Makeover.” If you haven’t seen it yet, take a moment and watch it here. (I found it this week. – thanks to “The Creative Sandbox” – by Google) (For those of you not familiar, Google explains it as, “A Showcase of marketing campaigns that blend creative genius with digital innovation. See cool stuff. Learn how it was done. Vote on your favorites). At this point, I’m assuming you watched it. I think it’s totally SMART. Essentially, what is going on here is a way for people (specifically women) to start paying attension to those sneeky little ads that pop up on the lefts and rights and sides of your screen. (ugh! they’re super annoying right?!) Right. It also creates a conversation that women want to start part-taking in. Think of the power of social media in terms of google rankings. Dove wins. Not to mention, they subtly brought up the idea of targeted advertisements. I think in an effort to warm the consumer up to the idea of them. It’s a hot debate these days. You may be for or against them. If you love them, then congratulations. You’re going to see more of them in the future. If you hate them, well do something. For starters, you can clean out your cookies. If you do that, you’ll be on the right track to non-targeted living. And well, that’s a start. But go on keep complaining, I like debate. As for Dove, I think their new campaign is working. It’s currently operating in Australia. (Maybe Australian women hate those little pesky ads more than the rest of us? I’m not sure.) But I wouldn’t be surprised if the campaign plants itself overseas real soon. My guess? It’s bound to flourish. Until then, go get some new soap bars. Because I Like to Save and You Probably Do Too? Sometimes it’s fun to shop. But it’s even more fun to shop and save. Which is why I’m sharing this coupon with you. I got in the mail this morning. See, I might be swamped at work but I’m still trying to do nice things for you. So, that must make me pretty great right? 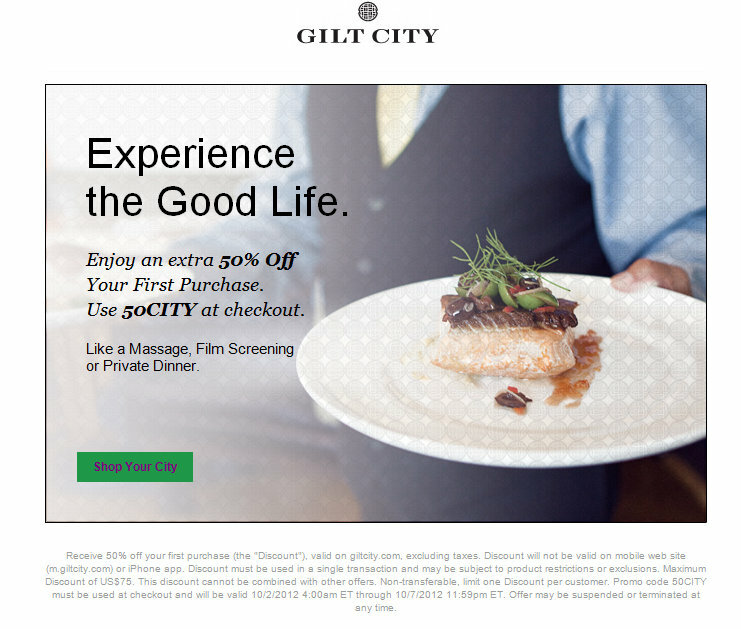 Anyways, the best part is this coupon is not for 10% or even 20% off – not for 25% or 30% – but a whopping 50% off your FIRST purchase from Gilt City. Now, I must be super great. For those of you who don’t know, Gilt City offers sales on fun events/items in oh, about 13 cities nationwide. Like brunch? Want to get glamorous eyelash extensions? Get your DNA Analyzed? (Yeah, I did say DNA.) Well, Gilt can help you out with that. In the past few years, viral marketing has become a huge component of advertising. Crafting a successful marketing campaign is more difficult than it looks. While viral marketing does requires successful planning and research, it doesn’t always require a large budget. Dollar Shave Club was a start-up competing in a v. competitive industry. Essentially, DSC spent $4,500 on a youtube video and in just over one week, attracted over 4 million viewers – A figure high enough to crash the company’s website. If you haven’t seen the video – have a look. With that many hits, I think it’s safe to say Dollar Shave Club got the consumer to notice their product. And not only did they get the consumer aware of their product, they convinced them to buy. In a matter of a week, 12,000 consumers signed up for the monthly membership. The video was sent around the internet like wild-fire. Watches increased, back links pointed them, and so , search rank soared. Crazy things happened. Today, Dollar Shave Club ranks on the 1st page of google for the word “shave”. The term alone generates, 12,100 exact matches on global search per month. Broad match “shave” generates a whopping 3,350,000 global searches per month. At this exact time, the video has 6,779,441 subscribers.